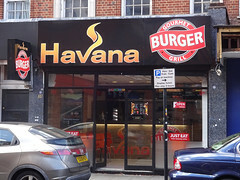 Burger takeaway ("gourmet burger grill") on South End. It also does delivery, with online ordering via Just Eat. By July 2012 it was a kebab and fried chicken takeaway called Sizzla Grill photo. By June 2013 this had become a chicken, kebab, and pizza takeaway called Bekali photo. Photos of Bekali menu as of June 2013: 1, 2, 3, 4. Photos of Bekali menu as of September 2013: 1, 2, 3, 4, 5, 6. Some time between April and November 2014, Bekali became Nefis Kebabs photo, and some time between November 2014 and April 2015, Nefis Kebabs became Afandina photo. As Afandina it had a few tables and chairs for eat-in, and did delivery with online ordering via Hungry House and via Just Eat. Afandina closed down by July 2015, with a baliff's notice photo on the shutter. Last edited 2019-01-06 14:28:59 (version 43; diff). List all versions. Page last edited 2019-01-06 14:28:59 (version 43).